I’ve gone to several parties recently with these cool glass beverage dispensers. It motivated me to look around on the web and try to see who sells them. During my search, I ran across the Godinger dispenser with a metal stand (model GGR010). This unit is for sale for less than $80 with free shipping from Hayneedle. I find this style of glassware quite stylish. 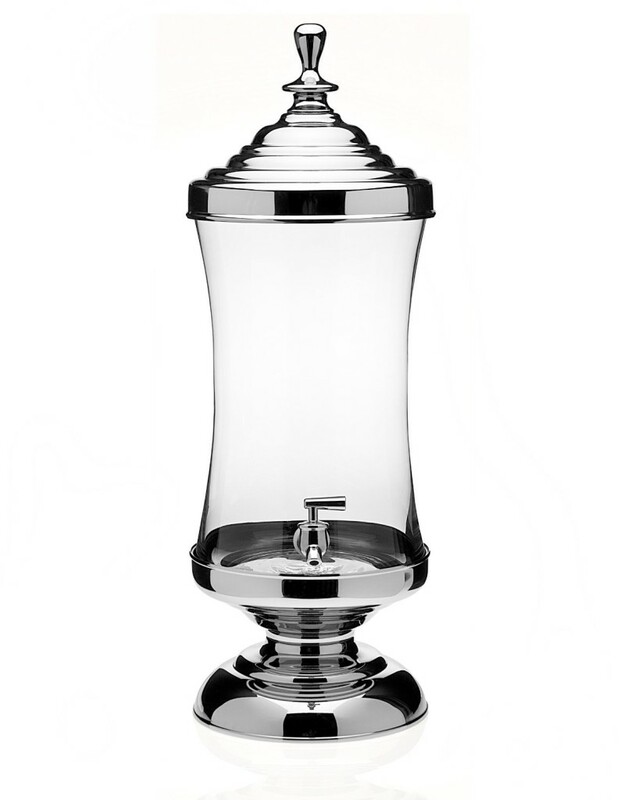 It reminds me of the kind of drink dispenser royalty would use to serve translucent batches of punch during elegant parties. In this fantasy, I would be the court jester, and we would all reach the perfect level of intoxication during a blissful yet relaxed night of enthusiastic mingling. Two and a half gallon beverage capacity. 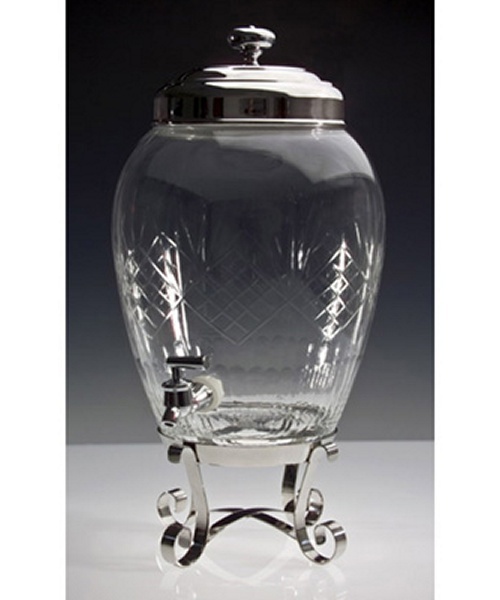 Twelve inch jar with a four inch stand for a total height of sixteen inches. High spout makes filling glasses convenient. 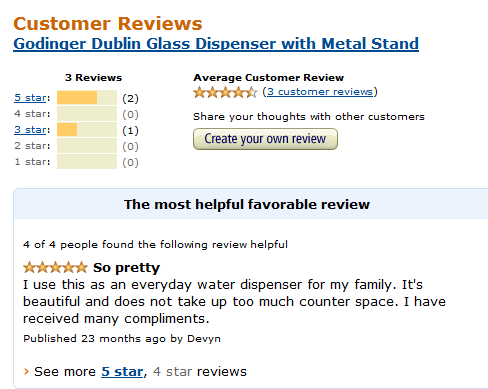 Reviews are fairly scant for this particular unit, although Godinger items in general have great reviews. Three reviews exist on Amazon. Two of the reviews are five stars, while the last review gives the unit three stars. They complained about what they cited as a cheap plastic tap. This style might be on the showy side for some. Others would use the word elegant though. It has to be hand washed. Given that it is glass, it would be far easier to break than a plastic unit. It also costs roughly twice as much as a plastic dispenser. It is a large item to store that might receive relatively infrequent use. Godinger has produced inexpensive yet elegant silver, glass, and crystal items for over fifty years. Arnold Godinger and William Lefkowitz started in the company in 1972. It is headquartered in Ridgeway, New York. I currently own one of their whiskey decanter sets. It is beautiful, although I largely use it for show since I personally worry about the potential health effects of drinking out of leaded crystal. There probably isn’t much risk since it has been a long time since I was under the age of six. Hayneedle has been in business since 2002. It originally started as Hammocks.com. The company used the popular microsite strategy of the time by starting dozens and then hundreds of niche focused websites. Almost all of these properties have since been rolled into and now redirect to Hayneedle.com. It is based in Omaha, Nebraska where it has over 400 employees. They have an A+ BBB rating and are frequently regarded as one of the fastest growing ecommerce sites. Godinger itself manufactures a few more lines of glass and crystal dispensers. 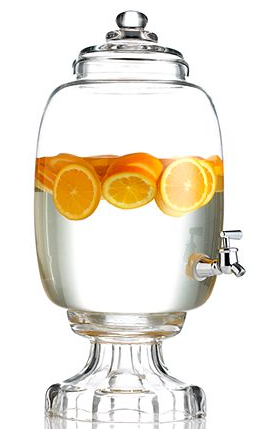 The Westbury dispenser by Godinger is one of my favorite alternatives. It holds 3 gallons of liquid as opposed to the 2.5 gallons the Dublin model holds. I find the glass base particularly attractive. You can find this model from Macy’s for a little less than $100. The Monticello dispenser also by Godinger is also quite attractive. This container holds two and a half gallons like the Dublin model. It maintains a four star rating on Amazon with over twenty five reviews available. Between the three suggested drink dispensers, I’m confident you will find the right choice to add an elegant touch to your next party. If you are lucky, one of these artistically crafted pieces will help make you feel like a queen or king in the comfort of your own home.